By now, many of you will know that prior to enlisting, two of “Our Boys” were living abroad, namely John Edmund Rogers and James Donald. In an age before the advent of air-travel, these two intrepid young men embarked on long, often perilous sea voyages, in pursuit of their dreams for better lives and prospects abroad. The Passenger Lists (where available) provide considerable and valuable information regarding an individual: date of embarkation, travelling companions (if any) and occupation. They also tell us the names of the Ships and the Shipping Lines they belonged to. Fleetingly curious about the ships, I spent a while investigating them; whilst the following doesn’t in any way add to the life-stories of John and James, I would nevertheless like to share with you the sad fate of two of the ships concerned. When John Edmund Rogers emigrated to Australia he departed from the Port of London, bound for Sydney, on the ocean liner, SS Omrah, one of the Orient Steamship Line. The date of departure was 16th August 1912. 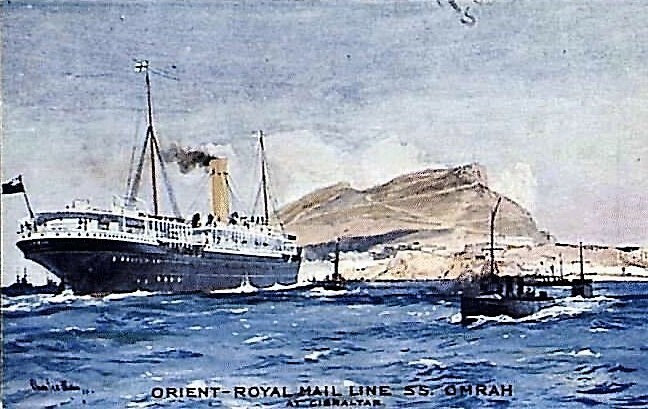 During WW1, the SS Omrah was commandeered for use as a troopship. On 12th May 1918, it was torpedoed and sunk by German submarine UB52, whilst heading from Marseilles to Alexandria. One person died as a result of the attack34. James Donald is recorded as sailing for Calcutta, India, on board the SS Matheran of the Brocklebank Line on 2nd June 19073. This would suggest that he had visited Cockshutt to attend the Licensing of his brother, the Rev. John Rowley Donald4, who had recently begun his incumbency as Parish Vicar of Ss Simon & Jude, Cockshutt2. On 26th January 1917 the SS Matheran was sunk off the Cape of Good Hope following a collison with a mine which had been laid by the infamous German ship, SMS Wolf. One man died1. The following is a list of the locations, around the world, where “Our Boys” are remembered including Commonwealth Cemeteries and Memorials.